Did a bit of spring cleaning for the Chinese New Year and decided to decommission my Thinkpads T30 and X41 Tablet. However, before I give it to the rag-and-bone man, I had to remove the hard disk, lest I incur another bout of Edison Chen. There are quite a number of software that wipes the disk clean but me? I do it old skool by driving a stake right through the platens, shattering them in the process into tiny bits and have the hard disk rustle like a percussion shaker. Fresh Fry: You'd be glad to know that your photos are safe. only for laptop hdd only coz the shell is aluminum. 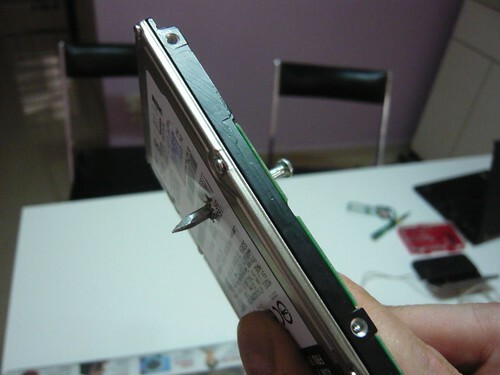 the outer shell for normal desktop 3.5" or even 5.25" hdd is too tough to hammer through. You may have to remove the outer shell first before whacking it. The key is to destroy the platens. By driving a hole, you only punch a hole through, you also shatter the platens as they are very brittle in nature. Interesting. I wanna do this too. If not I end up like half of Twins or Cecilia too. Thiang! : Just make sure you use a concrete nail or something similarly hard. Some nails are too soft to be able to penetrate the aluminum shells let alone the platens inside.